Some marketing topics are complex and require a lengthy discussion. Other times, res ipsa loquitur applies. We think today’s discussion of lawyer website biography photos might be one of those. 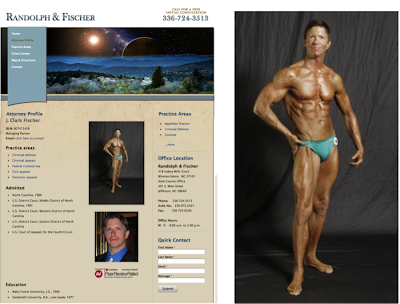 Over time, attorneys grew willing to soften the formal website photos we used in the early 2000′s. For example, we like the friendlier “environmental” pictures we shot for litigation powerhouse Hedrick Gardner. Increasingly, lawyers with a more casual style have eschewed suits and ties in favor of business-casual attire. Photos can help provide information that text cannot. And Mr. Fischer’s “head shot”? I’ve never met Mr. Fischer, but suddenly I know a lot about him. I mean, like, an AWFUL lot. What do you think? Please feel free to comment below. Perhaps if he’s ever handling a case in Chicago, Mr. Fischer could grab a cup of coffee with one of our more [insert adjective here] matrimonial lawyers, Corri Fetman (below), who gained some national notoriety a few years ago with her “Life’s Short. Get a Divorce.” advertising campaign. I have a feeling they’d get along just fine. Looking for a powerful new website? Oil yourself up and contact Fishman Marketing at moc.gnitekramnamhsif@ssor or +1.847.432.3546! Photos (c) 2013 J. Clark Fischer and Corri Fetman.